If cooking, at its highest levels, is an intuitive, almost musical art, then so is putting together a great restaurant. No one knows this better than the great Michelin-decorated chef and restaurateur Alain Ducasse, whose much-anticipated New York debut, eight years ago, was an extravagant, tin-eared flop. The first Ducasse venture, Alain Ducasse at the Essex House, opened a year before 9/11, at more or less the precise time New Yorkers lost their collective taste for Continental haute cuisine. The walls were covered with paint-splattered tubas, among other assorted Eurotrash frippery, and dinner was attended by all sorts of bizarre rituals. Women were given stools on which to place their handbags, certain dishes (the squab, I recall) came with a choice of little knives presented in a leather case, and patrons were even offered a choice of pens with which to sign their outrageously inflated check. Ducasse eventually tried adjusting to local tastes on the fly, but it was too late; before the doors ever opened, the joint was doomed. But superstar chefs do not attain their lofty status by being thin-skinned, and now, after a brief interval of study and introspection, Monsieur Ducasse has returned. Adour Alain Ducasse is the name of his new restaurant, which opened at the beginning of the year in the St. Regis Hotel. It’s a much grander venue than before, and this time around the chef has wisely hired local design guru David Rockwell to help channel his aesthetic vision. Predictably, this vision involves the chef’s somewhat baroque version of the purist, back-to-basics themes that animate the city’s food scene these days (the restaurant is named for the Adour River, which flows near Ducasse’s hometown in southwestern France). The Eurotrash knickknacks are gone, replaced by subdued hues of burgundy (the Website calls the interior “wine-inspired”) and burled mahogany. The chairs are burgundy, too (and still equipped with furtive pullouts for handbags), but the principal decoration is a series of well-stocked wine coolers, framed by a pattern of silver grape vines. The table service is similarly muted, at least by Ducasse’s standards. There are no waiters in tuxedo (they wear brown suits), no trolley carts, no proffering of ridiculous knives in ridiculous cases. The butter is studded with black olives, not truffles, and if you ask for non-bottled water, it’s poured from what looks like a handcrafted porcelain milk jug. The menu fits on two compact pages and reads as if Ducasse and his executive chef, Tony Esnault, had just returned from a listening tour of regional farm stands. The first dish I tasted was the “multicolor vegetable composition,” an assemblage of beautifully cooked winter root vegetables arranged in a spare, Cubist design. It was followed by a nicely sautéed portion of duck foie gras on a chaste bed of lentils, a delicate barnyard rendition of ricotta gnocchi (with sautéed romaine and a wafer of crisped prosciutto), and a brownish, slightly overpeppered cauliflower velouté served with what disbelieving guests at my table identified as a small toasted bagel. The chef’s intent, of course, is to let these ingredients speak for themselves, and while you may not feel like beginning your meal with a $19 collection of beautifully cooked root vegetables, there’s no doubt he succeeds at exactly that. Ducasse’s expert seafood technicians slow-cook a meaty piece of halibut to a kind of light, uncanny whiteness, then paint it with a subtle, roux-based “ivory” sauce. The lamb entrée (it comes with a random scattering of apricots and a nice creamy pot of quinoa) doesn’t have much earthy lamb flavor to it, but it’s smooth enough to eat with a spoon. There are much better upmarket steak dishes around town than Ducasse’s strangely bland beef-tenderloin-and-braised-ribs combination, but you won’t find a more delicious, expertly prepared duck breast (“duck breast fillet ‘au sautoir’ ”), or, for that matter, pork loin, which the cheeky Frenchmen in the kitchen plate with a little square of pork belly, a wheel of loose, freshly made boudin noir, and a ring of apples that looks like the kind of pineapple decoration Yankees put on their country ham. Adour is supposed to be a fashionably wine-centric restaurant, but unless you dine with your hedge-fund cronies, most of the grand vintages on display around the room are out of reach. That said, there’s plenty of opulence available at dessert time, particularly if you order the modish “Contemporary Exotic Vacherin,” made with mangoes and a passion-fruit emulsion stuck with meringue. My guests also made polite noises about the “Raspberry Composition” (raspberries plus a hint of crème brûlée), and the excellent dark-chocolate sorbet, an intricate arrangement of chocolate flavors and varying textures topped with gold leaf and a handful of freshly baked brioche croutons. Whether New Yorkers will embrace this new version of Ducasse Lite is anyone’s guess. With recession looming, the maestro’s timing, again, couldn’t be worse. But this is a more settled, less histrionic performance than the last one, and ultimately more satisfying. And in these unsettled times, the St. Regis is as good a place as any for the most French of French chefs to make his last stand. Hours: Dinner, Sunday through Thursday 5:30 to 10:30 p.m., Friday and Saturday to 11. Prices: Appetizers, $17 to $29; entrées: $32 to $49. Ideal Meal: Foie gras ravioli, duck breast or pork loin, dark-chocolate sorbet. 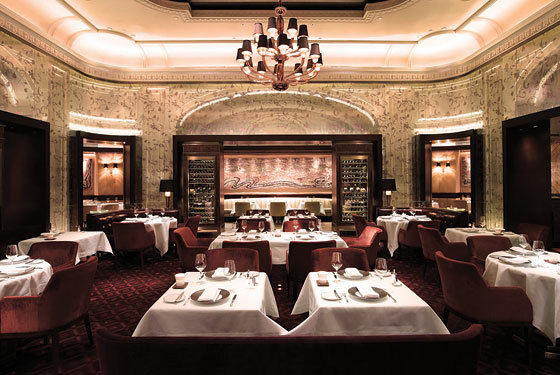 Note: In another nod to local tastes, Ducasse now offers a limited bar menu. The bar, however, has only four seats. Scratchpad: Ducasse’s new, occasionally flat interpretations of local tastes is rescued by the elegant room (one star), the elevated cooking technique (another star), and the desserts (the third star).